In addition, made of specially formulated materials that don’t cause irritations or allergic reactions to sensitive skin. Instapark Cervical Neck Traction Device. Single air chamber, adjustable nylon strap and a hand air pump allow you to customize the device for optimal support, compression and comfort. Why be another statistic when pain relief is ‘Only a Squeeze Away’! Removing and deflating them is also as simple. Soft cloth is used to avoid irritation around the chin and neck area. ONE SIZE FITS MOST - These cervical collars can be used by teenagers, adults, and elderly individuals. In addition, made of specially formulated materials that don’t cause irritations or allergic reactions to sensitive skin. Multi-layer air chambers, adjustable nylon strap and a hand air pump allow you to customize the device for your desired support, compression and comfort. Easy to use, comfortable and non-threatening. 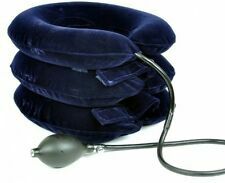 Soft air-pressure neck traction for instant cervical pain relief. ●Restoration of a natural cervical curve. ●Cervical neck spasms. IS NECK OR SHOUDER STRAIN KEEPING YOU FROM ENJOYING LIFE FULLY?. ●Neck, head or shoulder pain. ①Use a mirror to position the device correctly. Why be another statistic when pain relief is ‘Only a Squeeze Away’! Anyone looking for neck pain relief can benefit from a Cervical Traction Collar. Quality You Can Trust With Syrtenty! Removing and deflating them is also as simple. In addition, made of specially formulated materials that don’t cause irritations or allergic reactions to sensitive skin. Instapark Cervical Neck Traction Device.